Auckland, Rotorua, Nelson, Kaiteriteri, Blenheim, Queenstown, Milford Sound & more! Spend 10 days exploring the North and South Islands of this small country packed with wonders. Sample local wine, walk through an ancient rainforest, and learn about local legends and cuisine from the Maori. Take a deep breath to fill your lungs with the impossibly clean air here — and fill your soul with the legendary Kiwi spirit. The ‘Land of the Long White Cloud’ – it’s a classic Kiwi understatement if there ever was one. And while most travellers are drawn here for those epic experiences out in nature – the open spaces, the dusted peaks, the lakes that pop with blue and make a mockery of Instagram filters – that stuff is just the tip of the glacier. Come for the bubbling geysers, stay for the friendliest folk in the southern hemisphere. Depart Home on regularly scheduled flight to Auckland, New Zealand. Upon arrival, proceed through customs and immigration before making your way to the arrivals hall to meet your driver for a private transfer to Stamford Plaza hotel. Stamford Plaza has a superb central location in the heart of the city and is within easy walking distance to the lively Viaduct Precinct and the Waitemata Harbor. Your room will be available for check in on arrival to freshen up after your flight. 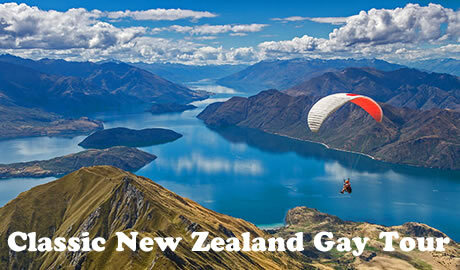 Participants joining from the Classic Australia Gay Tour program will join this afternoon. Reconvene this evening for a welcome dinner with your fellow travelers. Board our coach this morning and travel south from Auckland through the rich farmland of the Waikato and on to Waitomo. Here, we will depart on an unforgettable journey through the Spellbound Glow Worm Caves. The only way to really enjoy Waitomo’s biggest and brightest glow worm show, is slowly. Rushing through will not do justice to such breathtaking spectacle. Take time to let our eyes adapt and we will be rewarded with the soft glow of many of thousands of glow worms. There are enough to gently light up an entire cave and bring you to a sense of wonder. Later, the relaxed and gentle tour will treat us to the beautiful Cave of the Spirit. Walk through a lovely succession of chambers to find speleothems, fossil remains of extinct moa and cathedrals filled with natural light, softly falling to the floor. We will have, 1 guide, 2 caves to visit, and 30 000 or more glow worms to amaze you. We will be able to watch glow worms up close, and you are more than welcome to bring your camera along with you. Following, continue with our driver to Rotorua, located in the heart of the central volcanic plateau and uniquely built on top of an active geothermal field. 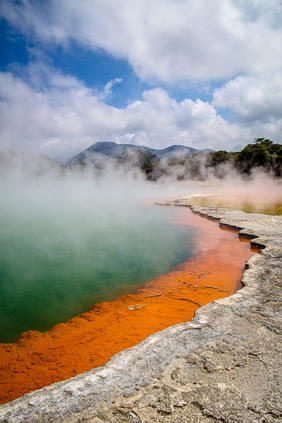 From bubbling mud pools, shooting geysers, natural hot springs and fascinating Maori culture, Rotorua has it all. On arrival, transfer to our accommodation Regent of Rotorua, an oasis of understated contemporary elegance and comfort amidst the exciting attractions and experiences Rotorua has to offer. Regent of Rotorua has its own award-winning restaurant, a separate cocktail bar & heated swimming pool. Our room is beautifully designed featuring contemporary decor with a touch of glamour. Enjoy dinner at leisure on Eat Street. This morning, visit Te Puia, New Zealand Maori Arts & Crafts Institute – Te Whakarewarewa Thermal Valley. A place of gushing waters, steaming vents, boiling mud pools and spectacular geysers, here our private guide will introduce you to the traditional arts and crafts being kept alive through the National Carving and Weaving Schools of New Zealand. Following, immerse yourself in Maori culture on a private tour of Ohinemutu the region’s original tribe settlement. Starting with a traditional mihi (welcome), by our local host and Maori guide, be entertained by captivating tales from Maori history. Ohinemutu’s location was chosen for its lakeside setting and abundant geothermal energy for cooking, bathing and heating. See bubbling mud, geysers and steam rising from the sidewalks. 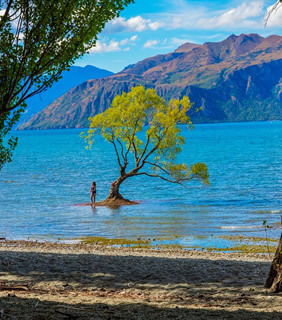 Transfer to Rotorua airport and board our connecting flights to Nelson, the sunshine capital of New Zealand. Nelson’s diverse geography captures everything from the long golden beaches to untouched forests and rugged mountains. 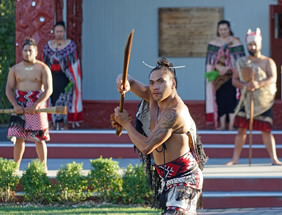 The region is also the undisputed creative arts centre of New Zealand. On arrival, we will be met and transferred the one hour drive to our accommodation, Kimi Ora Eco Resort. Tucked away amongst the bush with panoramic views of Kaiteriteri beach and estuary and close to the Abel Tasman National Park, Kimi Ora offers peace, seclusion and all the modern comforts. Enjoy the evening at leisure and immerse yourself in the serenity of this luxurious property. This morning, travel into the park on a luxurious vessel. Our guide will interpret the less obvious features of the park such as the early settler activity as well as Maori history and the endless stories that abound here, especially from the rich variety of vegetation, birds and aquatic life. Avoid the crowds and visit deserted beaches. Try some kayaking in the shallow sandy bays, jump off for a refreshing swim or walk over a headland and rejoin the boat at the next bay. During the day, enjoy a great lunch on board prepared by your friendly skipper. This morning embark on the scenic two hour drive over the Richmond ranges to Blenheim, situated in Marlborough at the top of the South Island. With over 70 wineries, a range of boutique breweries and even a world class distillery, add to this an incredible range of cafes and restaurants and Marlborough really is a “Gourmet Paradise”. Stop at a favorite local winery for a gourmet lunch before a behind the scenes wine tasting in the Cellar Door at Cloudy Bay Winery. Cloudy Bay was one of the first five wineries to have ventured in Marlborough – back to the mid-eighties, and above all the one who put New Zealand in the wine map thanks to its early wide spread attractive Sauvignon Blanc. Following, transfer into the heart of Blenheim and check in to your accommodation. A Heritage Collection hide-away amongst the vines, the Marlborough Vintners Hotel is a luxury hotel accommodation in the heart of Blenheim, Marlborough. Here, you can relax and unwind in the center of the region’s exquisite winery offerings. This morning, transfer to Blenheim airport and board connecting flights to Queenstown, New Zealand’s ‘Adventure Capital’. Made famous because many of its residents are hooked on adrenaline, the list of adventure activities is impressive, even unbeatable. Born as an 1860s gold-mining camp, 150 years later Queenstown’s compact downtown area is energized by a permanent buzz. All this awaits exploration once we have settled into our hotel. 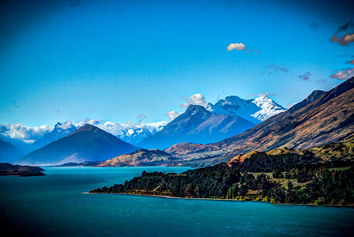 Centrally located, just a 5 minute walk from Queenstown, Hotel St Moritz has wonderful views looking out over Lake Wakatipu to The Remarkables mountain range. Its architecture and interiors offer intriguing works of art, bespoke furniture and refreshing colors, which highlight the unique charm of the place and the serenity of its surroundings. Enjoy the evening at leisure and take advantage of Queenstown’s vibrant café/bar scene and excellent shopping precincts. 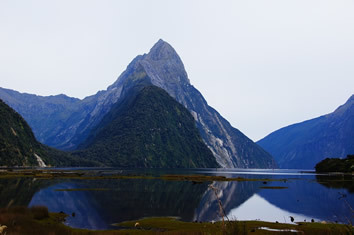 No trip to New Zealand is complete without visiting Milford Sound, often described as the eighth wonder of the world. Fly from Queenstown by light aircraft experiencing panoramic views of the alpine scenery, lush rainforest and finally Milford Sound. 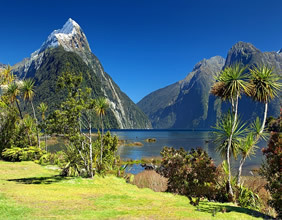 Board a luxury vessel and cruise the full length of the Milford Sound to the Tasman Sea. A comprehensive commentary is provided throughout the cruise and there is plenty of time available to view the waterfalls, rainforest, mountains and wildlife. Make sure you have your camera handy, as these are sights you will want to show all your friends! This afternoon get ready for the thrill of a lifetime with New Zealand’s world famous Shotover Jet – the ultimate jet boat experience. Feel your adrenaline surge as you accelerate into the towering Shotover River canyons. Your expert driver takes you skimming through the shallows in mere centimeters of water, blasting past the canyon walls, rocky outcrops and boulders. Enjoy a day at leisure, from the mild side to the wild side, capitalize on the choices available to you. Take a breathtaking ascent to the top of Bob’s Peak on the Skyline Gondola (2,592 feet above sea level) and ride the Luge, cruise Lake Wakatipu on the TSS Earnslaw Steam Ship, visit the nearby goldmining village of Arrowtown, see some of New Zealand’s native wildlife at Kiwi Birdlife Park, play a round of golf on one of the championship courses, discover the Central Otago wine region and taste the Pinot Noirs competing with the world’s greatest wines, meet some of the regions unique artists on a gallery tour, or head out to Kawarau Gorge to watch people jump off a perfectly good bridge – try bungy jumping if you dare! This evening we will gather for a group farewell dinner. Transfer to Queenstown airport this morning and board connecting flights home. • Transfers as per the itinerary. Arrival in Auckland & departure in Queenstown is Group Transfer only. A designated flight will serve as the Included Group Transfer. Flights not arriving at this time may require Private Transfers at additional cost. Intra-tour flights are additional. The cost is currently $550 in coach class. Coda Tours will book the intra-tour flights. Rates are subject to change until ticketed. • Any other item not mentioned in Inclusions. The Stamford Hotel is ideally located in the heart of Auckland CBD (Central Business District), 8 minutes’ walk from shopping and fine dining on Queen Street. All stylish and sophisticated guest rooms and suites include a 40-inch satellite TV, a mini-bar and tea and coffee making facilities. Each air conditioned room offers a luxurious bathroom with plush bathrobe, slippers and guest toiletries. Dental kits are available for an additional charge. The heated indoor pool and fitness center offers unrivaled views of the harbor and city to complement your swim or workout. Stamford Plaza Auckland also offers a 24-hour front desk and dry cleaning. Stamford Plaza Auckland has 2 in-house restaurants and a lobby bar with an extensive selection of wines, cocktails, beers and other beverages. Knights On Albert Restaurant is open for buffet breakfast, lunch and an exclusive a-la-carte dinner. Kabuki Teppanyaki Restaurant is an elegant and theatrical Japanese restaurant with interactive dining. High Tea is also available at the hotel daily from 11.30 until 16:00. The Regent of Rotorua Boutique Hotel features a heated outdoor pool, indoor mineral pool, restaurant and unlimited free Wi-Fi for guests to enjoy. All accommodations has modern décor and includes designer furniture and luxury linen. Regent of Rotorua Boutique Hotel is within 5 minutes’ walk of local shops, bars and cafés. The Rotorua Museum is a 3-minute drive and Rotorua Lakefront is 8 minutes’ walk away. The fitness center provides a rower, cross-trainer and exercise bike. The courtyard and pool area offers sun loungers for guest comfort. All rooms and suites feature a flat-screen LCD TV with satellite TV and an iPod docking station. All bathrooms include a Monsoon Rain Shower and toiletries by Natural Earth. Regent Room Restaurant & Wine Bar serves a contemporary Pacific fusion menu that includes sharing plates and tapas. For a relaxing place to enjoy a cocktail or a private dining experience the Regent Club Lounge is also available. Surrounded by vineyards in the heart of the Marlborough Wine Region, this boutique hotel features a hot tub, a fitness center and a stylish restaurant and bar showcasing local wines. Each suite includes air conditioning, free Wi-Fi and satellite TV. Marlborough Vintners Hotel is a 5-minute drive from Blenheim Airport and a 25-minute drive from Picton Ferry Terminal. Rarangi Beach is a 15-minute drive away. All suites include a small kitchenette, spacious bathroom with luxury bathrobes, and a lounge area with a DVD player and a selection of DVDs. Each has a private patio with garden or vineyard views. The Vintners Room Restaurant offers classic fine dining using local ingredients. Gourmet continental breakfast is served in the dining room each morning. Room service is also available. This property is a 7-minute walk from the beach. Located in the heart of Queenstown, with views overlooking Lake Wakatipu and The Remarkables mountain range, Hotel St Moritz Queenstown features a restaurant, bar, fitness center, and garden with hot tub. Each room and suite is appointed with modern essentials, including a 40-inch LCD TV, iPod docking station, in-room movies, and satellite TV. Free WiFi is also provided. All rooms at Hotel St Moritz Queenstown - MGallery Collection have a separate private bathroom, pair of reading chairs, writing desk, tea/coffee making facilities and a mini-bar. Lombardi Restaurant features a brasserie-style dining room and offers superb views of the lake, mountains and town center. Guests can enjoy wine, cocktails and other drinks at Lombardi Bar. A deposit of $750 pp is required to hold confirm your participation on the trip. Final payment is due not late than 60 days prior to departure. The deposit may be made by any major credit card; final payment is payable by personal check. Payments by credit card are assessed the 4% credit card fee charged by the credit card company. If you would like to make arrangements to pay in installments, please inquire with us.